OK, actually making bentos took longer than I thought. I spent most of my week in meetings (new job teaching in the fall!!!) so Shaun and my mother in law were on kid duty and therefore lunch duty. Today, however, we went to Target and found really really cute snack containers in the Dollar Spot. They had girl ones with Ariel and boy ones with Nemo and they were only $1 and my kids are spoiled, etc, etc, etc. Oh, and they had two packs of gel ice packs to match too. See! Anyhow, we went home and F&B played outside then decided they needed a snack. And in their world, snacks on a day with new containers mean snacks in bentos. So I obliged. Faith's is on the left--cheese, pretzel goldfish & an egg shaped like a fish. Ben's is on the left--cheese, pretzel goldfish and an egg shaped like a car. Thanks to the lovely Michelle for the new egg molds, they were quite the hit! no fair, no fair, no fair!!! My Target $1 spot didn't have those! They had everything else Aerial and Nemo under the sun... why not these. Ice packs? What ice packs? I wanna see the ice packs! I saw those containers, but didn't get any. Had they been Cinderella instead of Ariel--then definitely. I'm commenting because I was at Kroger today and they had 12 packs of those silicone baking cups Buy One Get One Free! So I bought two of course. The ones I got were pastel yellow, pink, green and blue. I think they also had some that were just blue and red. 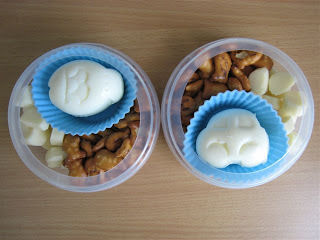 Love the egg molds!! 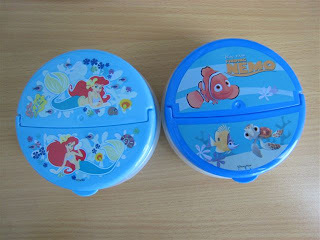 I also picked up the Nemo ice packs and snack containers for my 11 month old grandson and splurged on the $2.50 Nemo pop-up hamper in the same area. Our Targets have yet to carry those! It's very disappointing. I've become such a bento thrifter!